In early January, something historic took place in the small, unincorporated South Bay neighborhood of Del Aire. 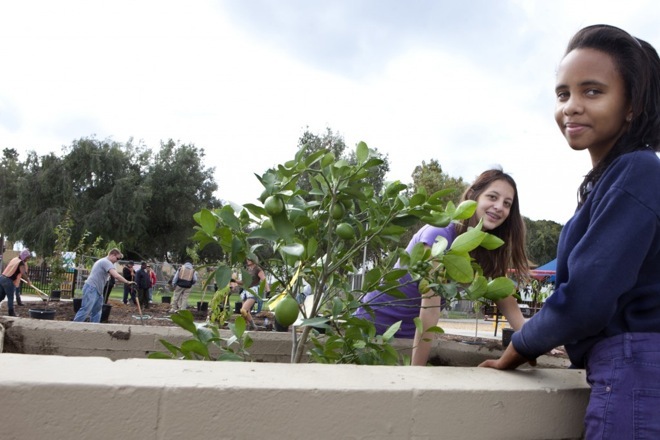 Thanks to Fallen Fruit, Supervisor Mark Ridley-Thomas, the L.A. County Arts Commission, and the Department of Parks and Recreation, California’s first public fruit park came to fruition. Other questions arose during the planning for this park—including several from the L.A. Department of Parks and Recreation Deputy Director, Joe Mendoza—along the lines of whether or not people will know when to pick the fruit, will they know what to do with it, and what would happen if it turned out that nobody in fact wanted it. But the groups were able to work together to try this out as a pilot project. The story of opening the Del Aire Fruit Park, and the challenges it faced as outlined in the KCET article referenced above, may be turned into a short video documentary if it garners enough votes in an online ballot currently open at the KCET Artbound webpage.